I ate at Chef Hung’s both on the day I arrived in Vancouver and the day I left. They’re a Taiwanese chain that specialises in beef noodle soup and on the very cold day that I arrived, the idea of a soothing, comforting bowl sounded great. 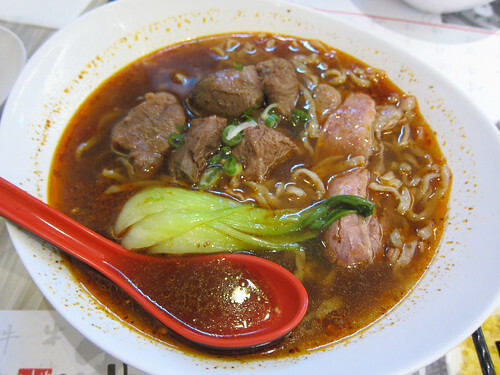 That evening, I slurped down a bowl of their Champion Beef Shank with Noodle in Spicy Soup (with extra fire chilli soup) and felt all the better for it. I like that you get a choice of noodle – our favourite are their thin noodles though wide noodles, rice vermicelli and others are also available. The spicy fire chilli soup is indeed spicy and numbing too with lots of chilli oil and Sichuan pepper. The beef came in two variants – cubes of stewed shank that were falling apart and slices of another cut (not sure which) that were gorgeously tender. The noodles were just al dente and softened slowly in the broth as I slurped my way through them. This was an excellent bowl of Taiwanese beef noodle soup. Sure, all very pretty but dammit, where’s the snow?! 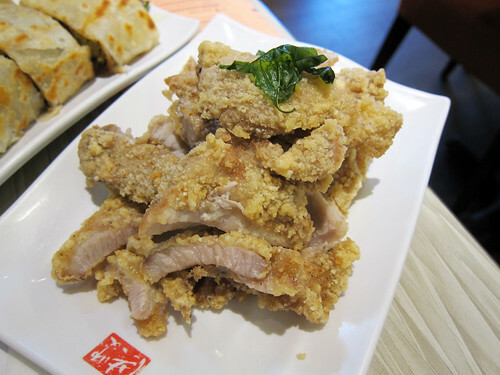 My last meal in Vancouver was also at Chef Hung’s. I love that place. Again we had their spicy beef noodle soup only this time we shared one bowl. I’ve got to mention the pickles. 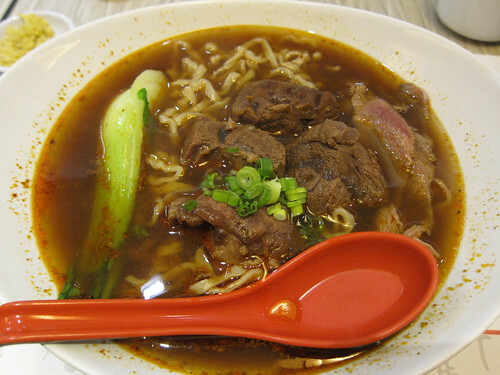 These are provided with every bowl of beef noodle soup and they are the perfect accompaniment, all tangy against the rich meat and broth. 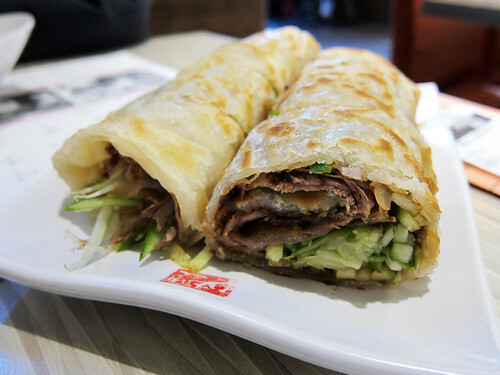 …and a marinated beef wrap made with a freshly griddled flaky flatbread, slices of stewed beef, hoisin sauce and cucumber and spring onion. Brilliant stuff. 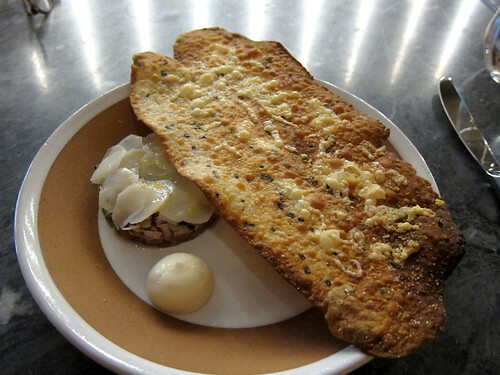 The flaky bread was delicious and the whole thing was made less heavy with the inclusion of the vegetables. Portions were so big that I was able to bring most of the beef rolls and pork along with me to the airport to supplement the terrible offerings by Air Canada. Yes, they packed up our leftovers very nicely indeed. What a great place – it’s yet another chain that I wish would open up in London! Other branches are listed on their site. And that ends my Vancouver posts this time! 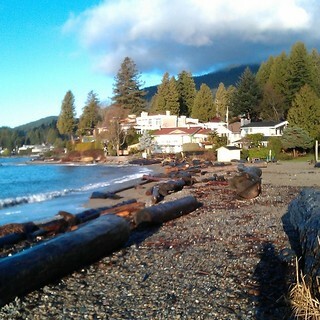 As usual, all my Vancouver photos from this Christmas trip can be seen in this Flickr photoset. Anyway, we first needed lunch. The restaurants all looked fantastic there and some even had ginormous queues that lunchtime but we headed to the popular food court on the top floor. 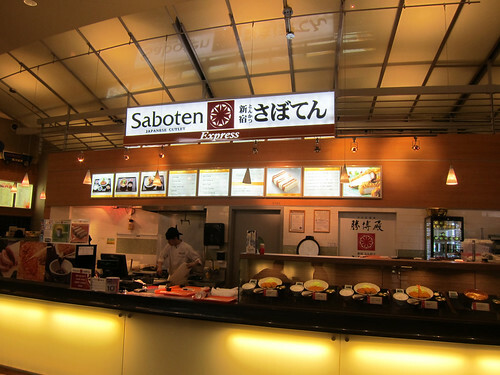 Among the teppanyaki, noodles and juice stalls was this gem – Saboten, a cutlet chain from Japan. I immediately ordered a Saboten set, which included a bit of pork tenderloin (melted in the mouth), pork loin, and a prawn. Each had been crusted in the flakiest, crispiest panko crumbs and were fried beautifully. The only downside was the pre-ground sesame seeds (to be mixed into the tonkatsu sauce) – these had lost some of their flavour. But considering that it was from a food court, this was all excellent! 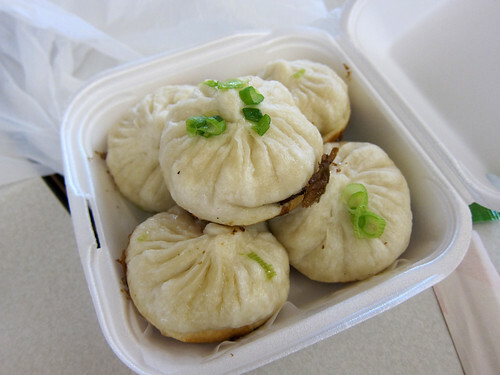 From another stall, I ordered shengjianbao – the juicy pan fried pork buns that are a specialty of Shanghai. Many tables seemed to have an order of either these or the steamed xiaolongbao from the same stall. Over to another Asian mall. 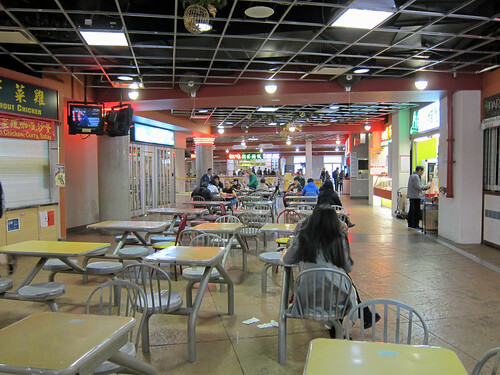 If Aberdeen Centre was Hong Kong, The Crystal Mall in Burnaby (next to Metrotown) felt like mainland China. We headed there on New Year’s Day in search of a bit of adventure – neither of us had ever been but we’d heard good things about it. Again there were some restaurants (all packed and with queues outside) but we again headed straight for the food court. It may look empty below but be rest assured that you’ll be fighting for a seat close to midday. There were so many options that we ended up running around buying bits and pieces from various stalls. 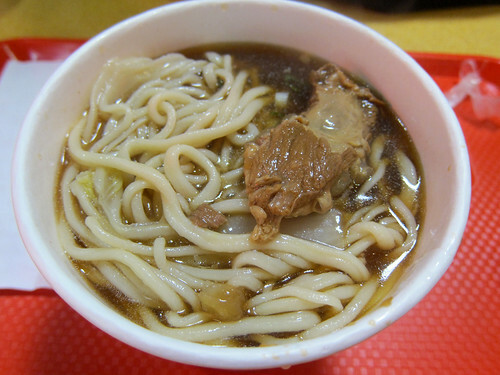 From a northern Chinese food stall, we had hand pulled noodles in soup with stewed pork ribs. The lady manning the stall pulled those noodles right there and then! 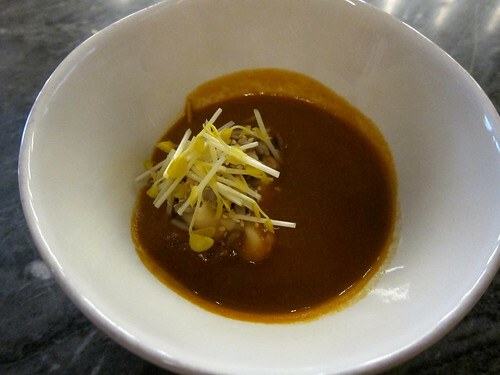 They were wonderfully smooth and chewy – it’s a shame the broth was a little dull though. 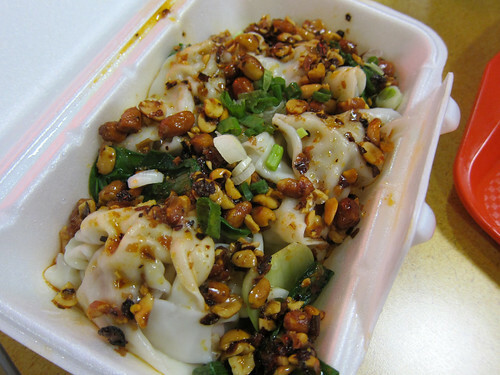 From a Sichuan stall, dry wontons with chilli oil and fried peanuts. This was insanely good and burning hot and crunchy and tasty and yes, just excellent. They’re addictive – you can’t stop at one! From a Xinjiang stall, we got a few skewers coated in chilli and cumin. 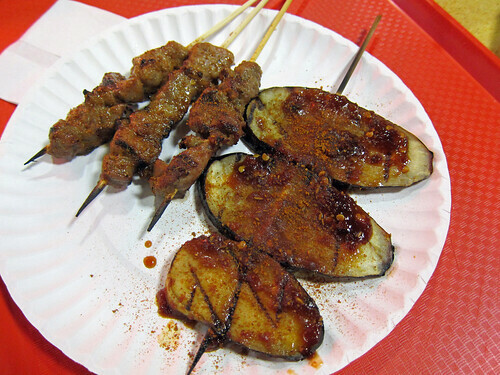 There’s aubergine and the usual lamb/mutton and, quite interestingly and totally inauthentic, pork skewers too! 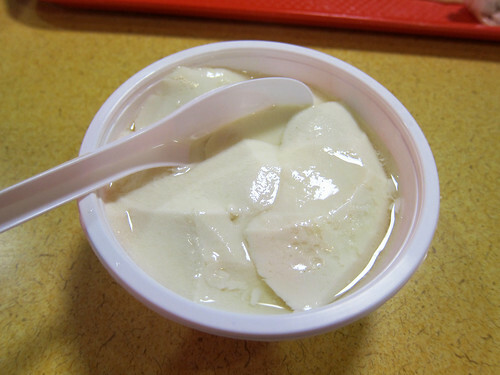 We saw a woman walk by with bowls of hot tofufa (or dou hua) – extremely silky soft dessert tofu served hot and with syrup. That was it! We packed up the rest of the food that we couldn’t finish and my father ran over to the stall to order some. 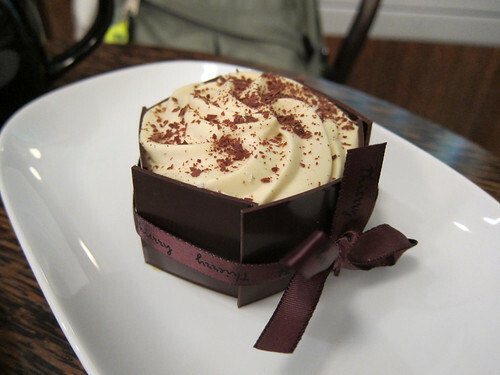 It was perfect – warm, silky, smooth, soft, and with just the right amount of sweetness. 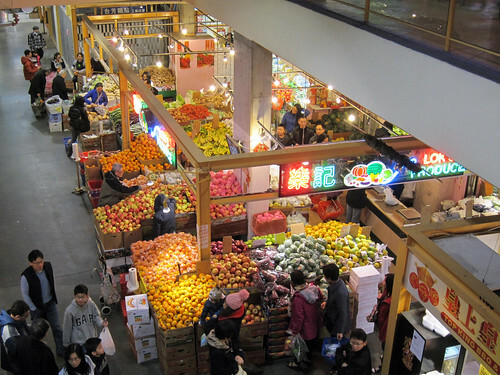 The malls are certainly good fun and both are close to Skytrain stations, making them easy to access for the tourist who’s looking to see something a bit different in Vancouver and who’s depending on public transport. And you’ll eat very well! 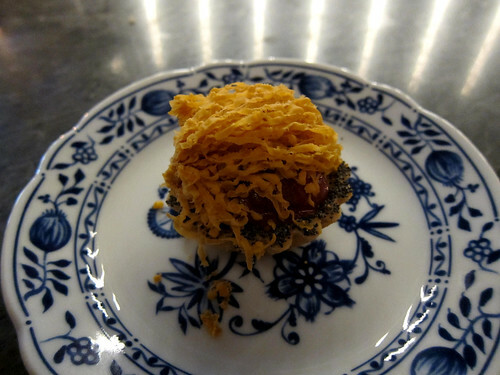 There’s a story with Pidgin, the restaurant in Vancouver that only opened a little under a year ago and that is now known as one of the most innovative restaurants in the country, if not North America. It’s location is infamous in Vancouver – it’s in the centre of the downtown eastside, an area notorious for drug use. It never used to be like this; the decline of this area only started in the 1980s but recently there’s been a lot of development in the area. I don’t know all the details about this development but it’s clear there’s a certain amount of gentrification going on too, which might push out the current residents of the area. It’s this possible moving and changing that got a few locals upset and they chose Pidgin as the representative business in all this gentrification and they protested against it. A lot of news was generated about the protest (and the counterprotest by other businesses) and as they say, any publicity is good, and soon, everyone in Vancouver knew about Pidgin. I don’t know all the facts so cannot tell you how I feel about this all but I’ll let one thing be known – it can be very scary in that area at night and during the day. I don’t think I’d walk down there alone. And I’m not sure exactly what I was thinking dragging my father there to try this place to celebrate his (very belated) birthday. It turns out the area’s not so bad on a Sunday night. 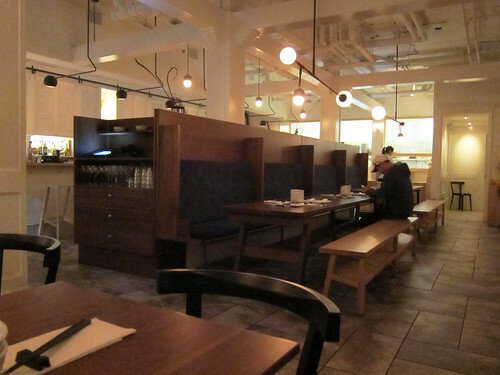 And the restaurant itself is gorgeous inside, as the photo below shows. Still, you can’t help but feel slightly uneasy eating in a restaurant when Vancouver’s poorest are right outside their glazed windows. The business has every right to be here but then again, so do the people living in the area. There are a lot of arguments flying about so if you’re interested, I encourage you to just google ‘Pidgin protests’ and you can see them all! But onto the food and drink that night. The drinks list at Pidgin was very impressive and I was pleased to see a small selection of ‘zero proof’ cocktails. 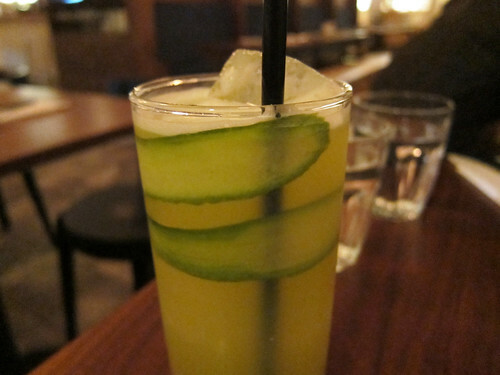 My Cordova – cucumber, jasmine, orange ($6) was a lovely and surprisingly dry blend that went down easily. Most nonalcoholic cocktails tend to just be very sweet fruit juices so this made for a great change. We started the meal with an oyster shot, apple, horseradish ($3) each. 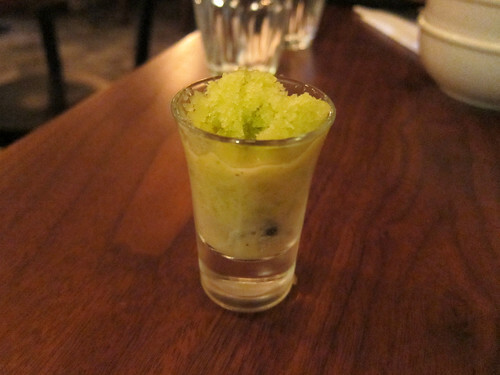 That shot glass held the shucked oyster, a mustard horseradish sauce, and apple granita – yes, it was a bit cold but the flavours altogether were great! Very zingy. 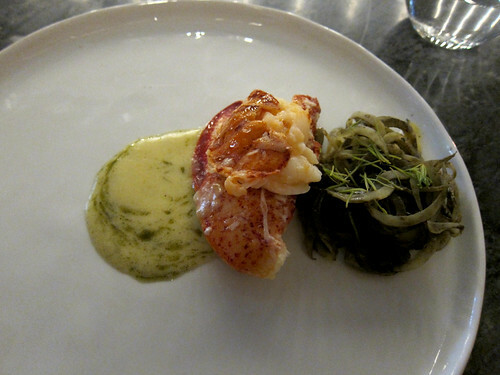 The dishes started arriving at a steady pace – all were placed in the centre for sharing. 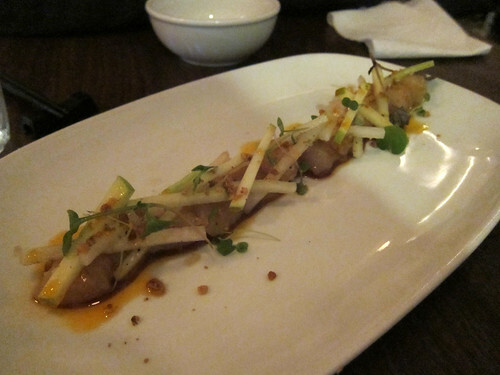 The Raw scallops, pomegranate red curry oil, daikon, green apple ($15) were utterly fantastic. The curry oil was tasty but not too strong and didn’t overwhelm the delicate molluscs. It’s also not perhaps clear in the photo below but there were a generous number of scallops under the crunchy strips of apple and daikon. 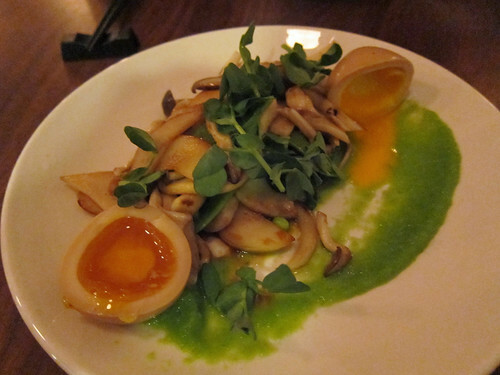 Our waiter recommend the Mushrooms, sugar snap peas, egg, soy yuzu brown butter ($12) and he really got this one spot on. A whole variety of mushrooms (I definitely spotted king oyster and shimeji) were stir fried with the snap peas and the butter sauce was outstanding on it all. A ramen egg provided wonderful yolky creaminess and body. 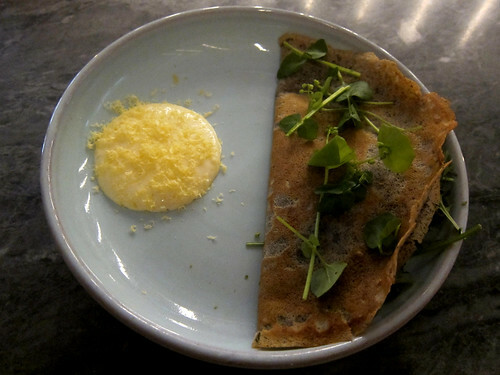 There was also a pea puree and pea shoots on top. The meaty dishes then arrived almost simultaneously. Beef brisket, miso gorgonzola crust, beets ($18) was a meltingly soft piece of brisket topped with a soft crust of gorgonzola and miso – though I’m not a fan of blue cheese, I thought this was alright. 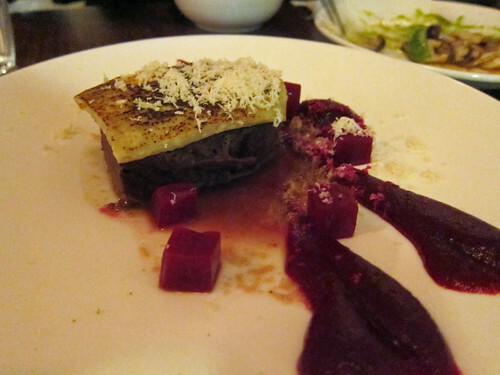 Actually, it was quite nicely balanced with the sweet beetroot, yet another thing I normally detest! The grated stuff on top that looks like Parmesan was actually lovely horseradish. 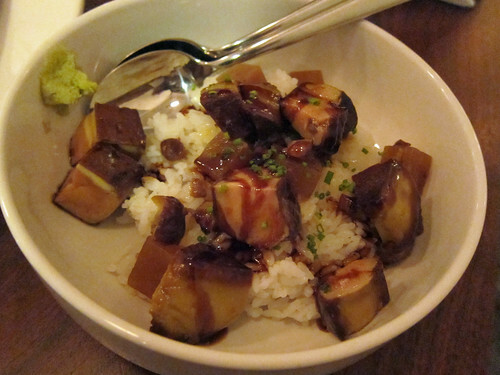 I was excited to see their foie gras rice bowl, chestnuts, daikon, unagi glaze ($20) on the menu as I hadn’t seen it online – this is one of their most famous dishes and after my experience with a foie gras rice bowl in Tokyo, I wanted to try another one! 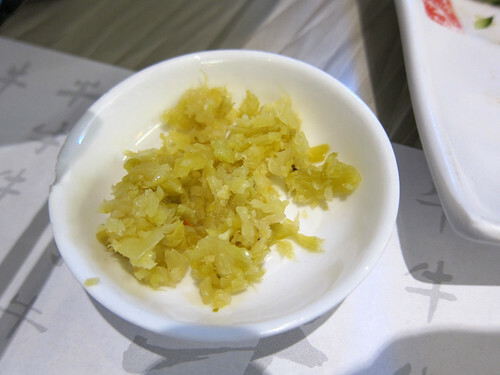 When this arrived, I stirred it all up together (including the freshly grated wasabi) and turned every spoonful into a well balanced mouthful. Delicious. Dessert time! 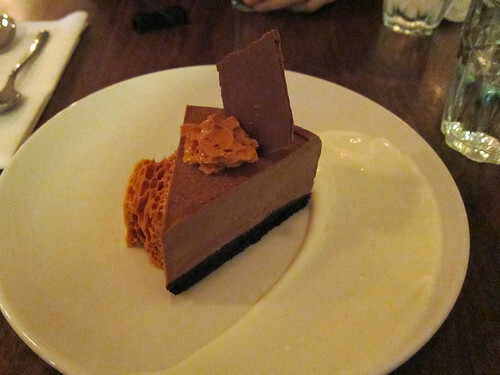 I chose the Milk chocolate ovaltine mousse, orange blossom yogurt, honey comb ($8) and it was the perfect finish to the meal. 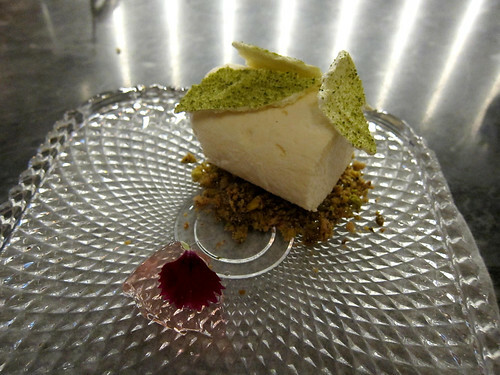 The combination of flowery yogurt, crunchy sweet honey comb and creamy, not too sweet, not too rich mousse was fantastic. My father, not being a big fan of desserts, chose to finish his meal with another oyster shot! 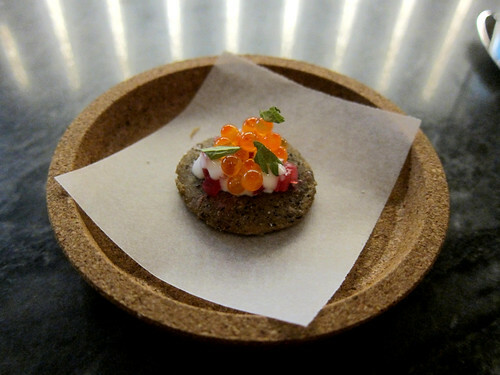 Pidgin is certainly worthy of the number of recent accolades it’s received. We had a fabulous meal and if I had time, I’d had loved to go back to try more. Reservations recommended. 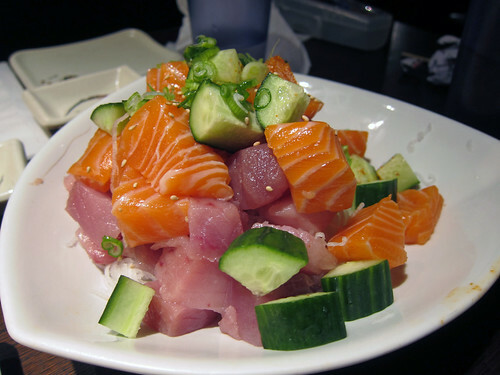 Vancouver is known for its plethora of cheap sushi restaurants. I’ll be honest, some of them put me off due to their grungy look or their suspiciously low prices but I’m now a convert! 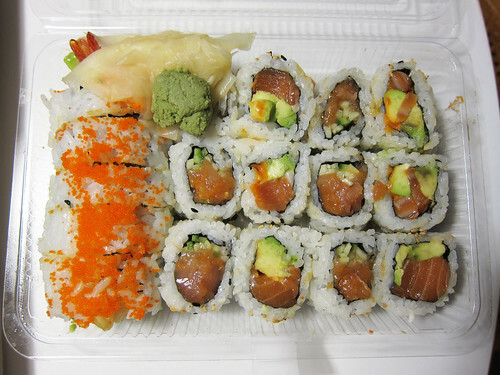 My father brought me one quiet day to Kin Sushi in West Vancouver to pick up some takeaway for our dinner. 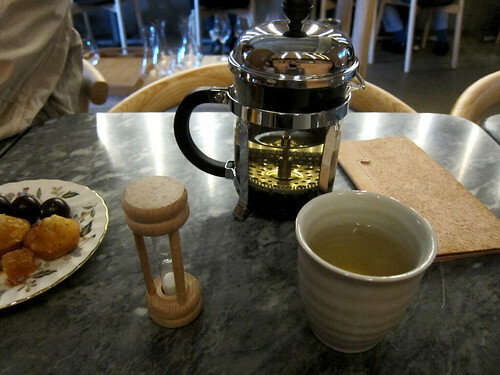 The tiny shop does have eat-in facilities though they’re very very basic. Most people come and get their order to go. While you can get lots of special rolls, we ordered their more basic combos – each of these was about $6 (with miso soup!). 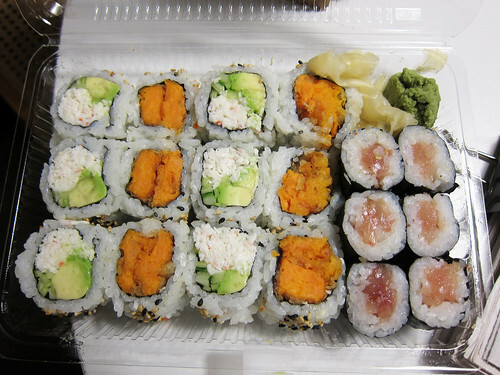 Here was a California roll, tempura yam (sweet potato) roll and tuna maki. 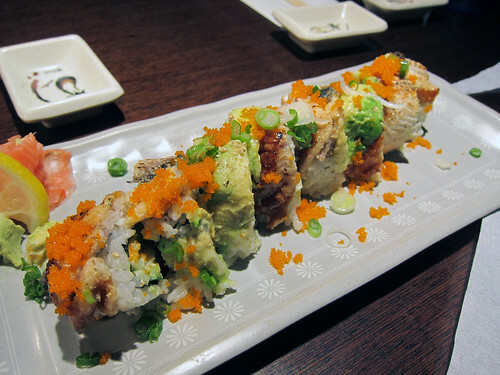 This was a spicy combo – spicy salmon roll, spicy tuna roll and spicy dynamite (tempura prawn) roll. 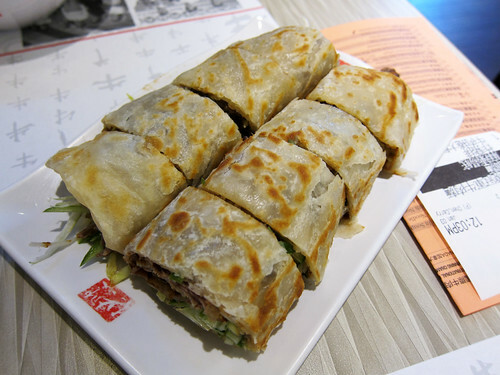 Of course, it’s not actually very spicy – there’s just a reddish sauce with a tingly heat mixed into the rolls. I was surprised by how tasty they are – they’re already about 20 times better than the sushi one gets at the major chains in the UK (I’m looking at you, Itsu and Wasabi). The next week, I met up with one of my best friends, her husband and her daughter for dinner and they brought me to Sushi Town on Marine in North Vancouver. This restaurant was absolutely packed on a Saturday night and there was a 30 minute wait for a table for four. And yes, the prices were amazing for what you get. This was a Double Dragon roll (about $8) – unagi on the inside and unagi on top too. Lots of eel! We had the spicy tuna and salmon sashimi (about $9) with the spicy sauce on the side (rather than have it all mixed in – it can overwhelm the fish) and the portion size that arrived was extremely generous. 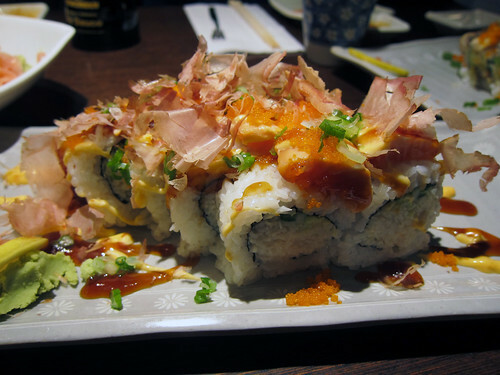 My friends’ normal order always included the Awesome roll (approx $7) – it’s like a California roll but it’s topped with seared salmon, masago (flying fish roe), spring onions and bonito flakes and then the whole thing is drizzled with teriyaki sauce and spicy mayonnaise. It’s totally and awesomely over the top. 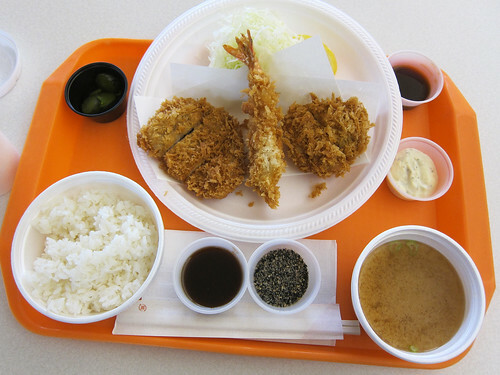 When the tonkatsu (about $8) arrived, I asked my friends whether they asked for one order or two. Yes, this is just one order. 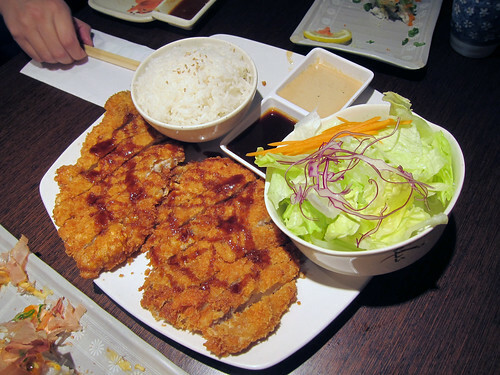 Two moist thin tonkatsu cutlets served with rice and salad – it’s big! 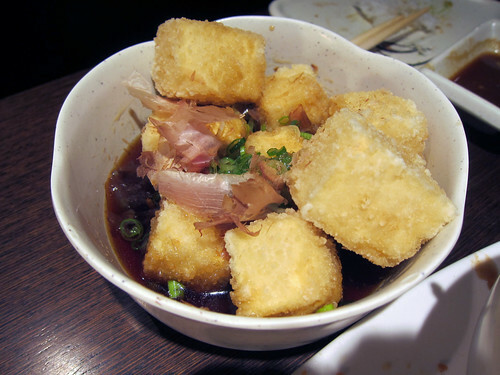 A single order of agedashi tofu (approx $4) was a large bowl of tofu cubes! The tofu wasn’t as silky as I like it but it’s still a solid dish. Of course it’s not the finest sushi you can find in the city but for bang for your buck, you can’t go wrong at these restaurants. In general, I’m not a fan of the tuna served here (not sure what type it is) and I prefer the salmon. The fish is fresh, their sushi is tasty and creative (North American rolls are crazy and crazy good) and it’s all certainly a bargain. It definitely scratched my sushi itch. Months ago, when I’d booked my flight to Vancouver, I knew that a couple of my close friends in London were also going to be in Vancouver at this time. We’d all grown up in Vancouver and somehow we all ended up in London. And when they heard that I’d be in Vancouver this Christmas-time, they both independently announced that surely we’d be heading to Shabusen for a meal together! Shabusen? I knew the name but had never been. It’s a well-known all-you-can-eat Japanese chain in Vancouver though I’ve recently learned that all but this branch at Burrard have closed. 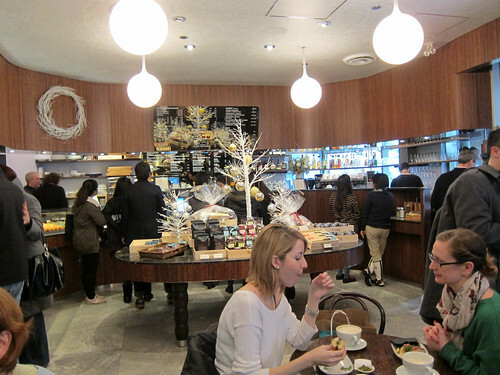 It was at this downtown restaurant that we arranged to meet one lunchtime after Christmas. We checked boxes to order food, we ate the food that arrived, we gossiped – it was a fun lunch! The only thing that was difficult to judge was how much food each order would contain. 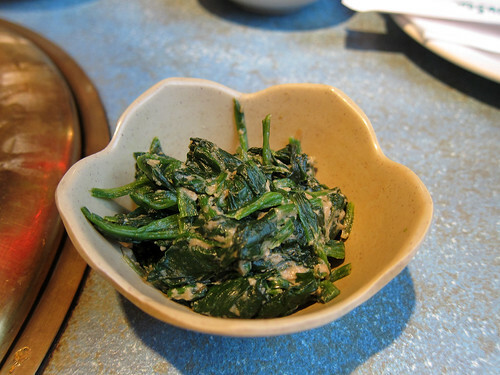 A portion of their tasty goma-ae, a sesame dressed spinach salad, was approximately a heaped tablespoon’s worth. 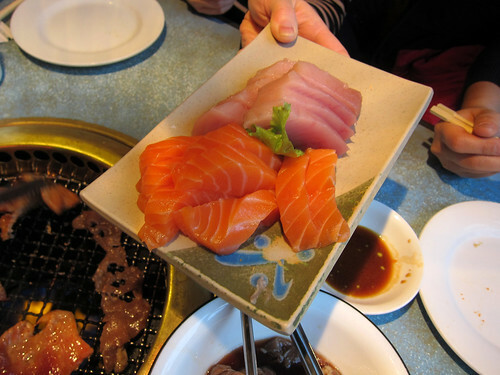 Sashimi (limit of 8 pieces per person) were very generous slices of salmon and tuna. 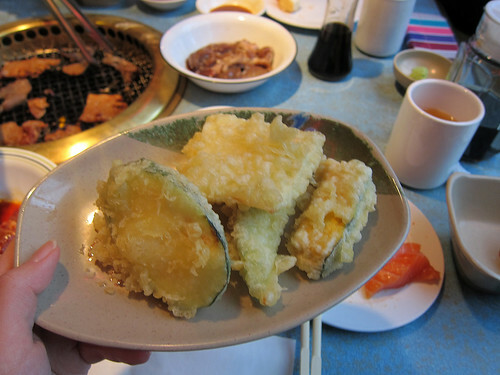 Tempura could be ordered by the piece and a number of vegetables were available. Maki sushi and nigiri could be ordered by the piece. 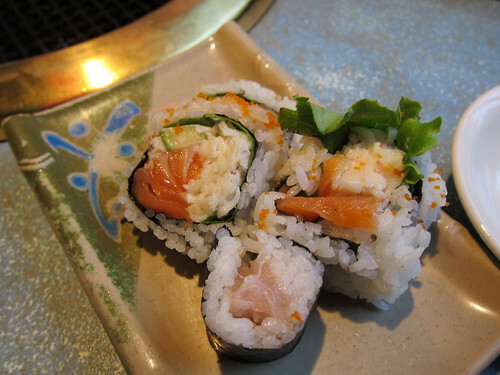 The ones with lettuce below are Alaska Roll (Vancouver has lots of unique rolls), which is a variant of the California Roll, with salmon in addition to the usual fillings. 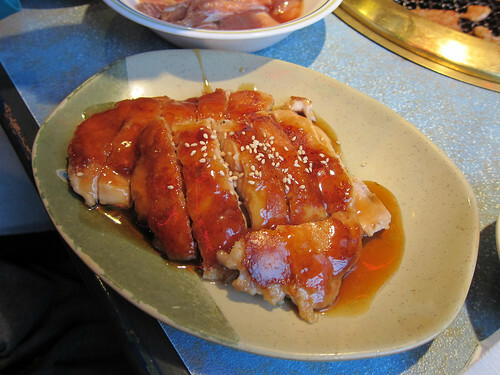 Two pieces of chicken teriyaki turned out to be this: two whole cutlets, sliced up. We were expecting smaller pieces so these large ones surprised us! One of the best things that day was the yakiniku (Korean-style barbecue) and you can see the size of each portion of marinated meat we received to grill at our table. It’s not a proper Korean place, of course, so there’s no lettuce to wrap your meat but we were fine with it just as it is. Spicy pork is the best of the lot, followed by the beef! 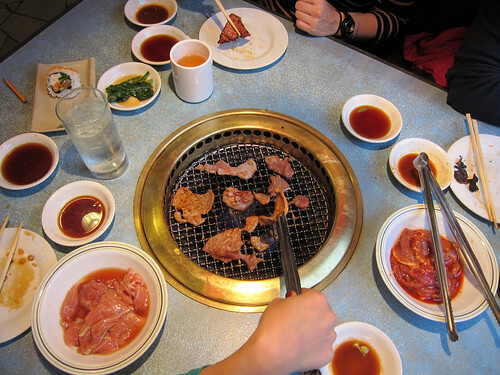 It really is a bargain here – only $15 per person for lunch for the AYCE including Korean barbecue option. It’s more expensive at dinner time but then there’s a longer menu from which to choose. Bookings are essential. Because they’re insane, my friends then suggested we head to a relatively new French patisserie that opened up just around the corner from Shabusen. Apparently, we needed to have dessert and the AYCE deal didn’t include any sweets at lunch time. Inside Thierry Chocolaterie Patisserie Cafe, there was plenty of seating (though finding a free table proved to be challenging) and one could order any of their patisserie or viennoiserie to eat in with coffee or tea. I tried a Tart Cafe Creme which was a coffee custard tart topped with a bit too much Chantilly cream and a thick coffee caramel round. Patisserie sizes are very Canadian (read: humongous) and we certainly struggled. Prices were reasonable though, with an average cost of $5-6 for a pastry (value for money is a desirable trait here). 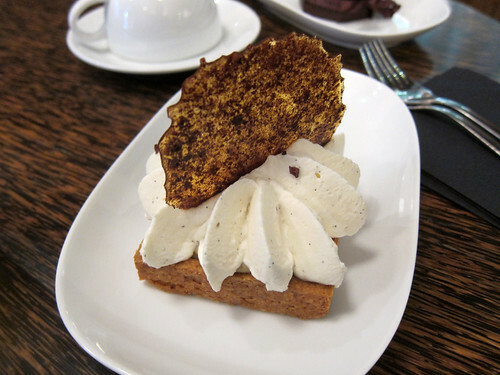 I was extremely surprised by the booziness of their Tiramisu; when they said that their sponge fingers were soaked with Kahlua, they really meant it! 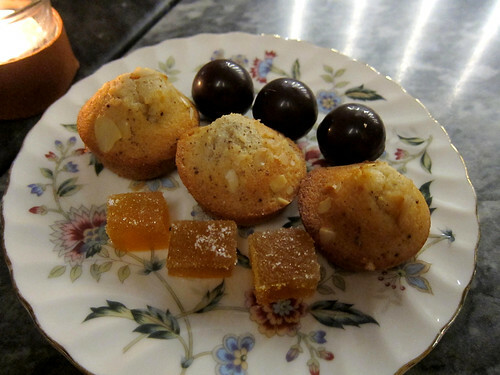 Portion sizes are certainly healthy here but the cakes we tried were just alright and perhaps a bit too sweet overall. Dang….the Vietnamese place we were going to have dinner was closed on Boxing Day. We drove on down Hastings, going to Vietnamese place number two on the list. 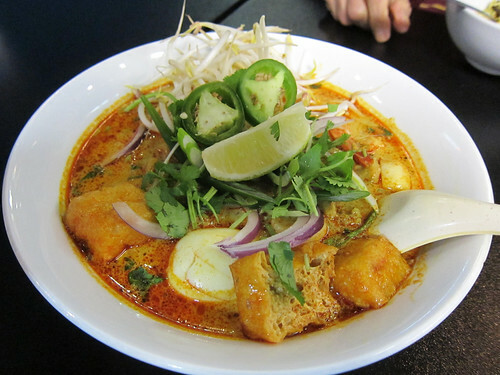 Not having gone very far down the road (a few blocks, I reckon), my father pointed out Laksa King on the opposite side of the road – this is his current favourite laksa place and he mentioned that the owners were Burmese. A split second decision was made – we were going to eat there instead and yes, it was open! The place was empty that evening though from what I gather online, it’s normally very popular (it was Boxing Day – not exactly a normal day). We had our choice of seats and chose to sit by the window, further away from the large screen tv playing a fire that wasn’t actually providing any warmth. Their menu was a great sounding mix of Malaysian and Burmese dishes. 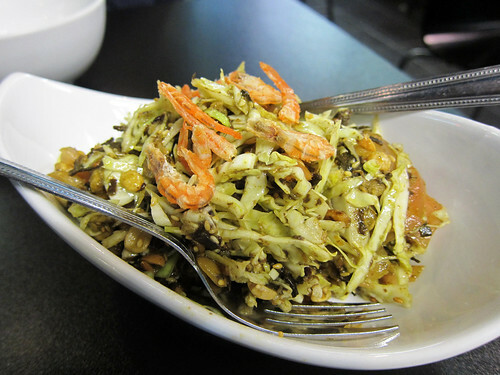 To start, we split a Lahpet Thoke ($8.00), a Burmese salad made with pickled tea leaf, tomato, cabbage, garlic chip, roasted peanuts, sesame seeds, broad beans and dry shrimp. A dressing made with lime juice bound it all together. I understand that Burma is one of the few countries where tea is actually eaten and I’ve been keen to try this salad for ages…if I could ever find it in London. 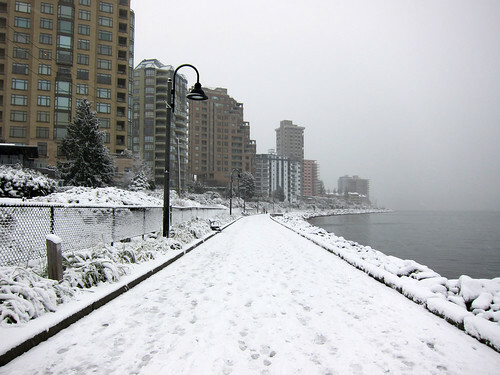 Luckily, here it is in Vancouver! The salad was zingy and very flavourful and full of different textures. And it was spicier than I expected and I ended up with pleasantly numb lips. My father recommended their laksa ($8.75) – it would be terrible if their namesake dish wasn’t very good but I can report that this was extremely good! The (very) spicy coconut curry broth was filled with rice vermicelli and yellow noodles (you can have either or both) and topped with a prawn, fish balls, tofu puffs, a hard boiled egg, chicken, bean sprouts, onion, coriander and jalapenos. Again, this was spicier than I expected but it was delicious! 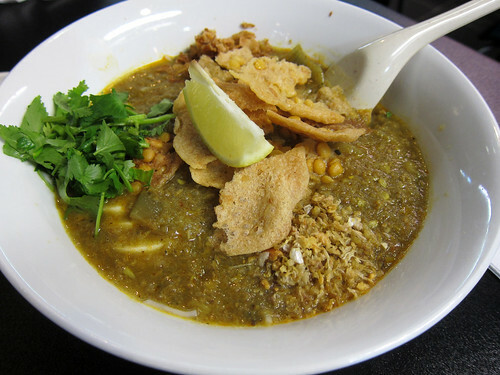 This is a most excellent creamy, spicy, complex laksa. We also had to try their Mohingar ($8.50), a rice noodle soup topped with their house blend of fish broth with onions, garlic, ginger, lemongrass and banana stem and there were hard boiled eggs and crunchy split pea fritters on top too. This was entirely new to me – I had had the mohingar in Mandalay back in London but that paled in comparison to this beauty! The flavours were wonderful, all fishy (in a good way) and spicy though not spicy-hot, and with lots of different textures again. The noodles in this dish were cut short and we were able to just mix all this together and spoon it into our mouths. 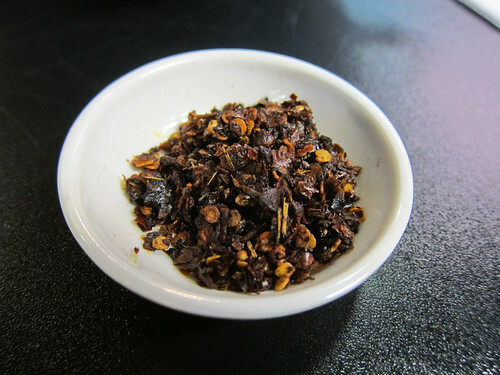 For spicy-hot, we were also served a toasted chili mixture alongside the mohingar – and this stuff was certainly hot! I have heard that their curries are oily but tasty and their roti canais are just ok. What I ate – fabulous. Highly recommended! Happy New Year, 2014, everyone!